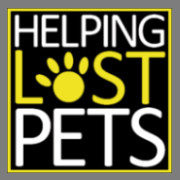 HelpingLostPets.com (HeLP) is a FREE nationwide database for lost and found pets that connects shelters, veterinary clinics, rescue groups, the public, and volunteer groups across the nation to effectively reunite lost pets with their owners. What makes HeLP unique is it is mapbased and fully searchable by breed, location, size, color, gender, and other identifiable information, making it easy to match lost and found pet listings. To ensure our listings stay current, our system automatically contacts owners/finders for status updates at defined intervals. This allows our system to remain up-to-date and display only pets that are still missing and truly need our help getting home. We have found that flyers are one of the most effective ways to reunite a lost pet. When someone list a pet, free flyers are instantly generated to provide an effective tool in getting a pet home. Using HeLP will improve your return-to-owner rate, as well as decrease the length of stay for many pets at your shelter. When a shelter helps reunite a family with their missing pet it creates goodwill and appreciation from the pet owner and your community. In addition, giving your shelter the tools to help reunite lost pets with their families will help reduce shelter intakes and decrease the number of pets being euthanized. The ASPCA estimates that 40-60% of shelter pets are actually lost, not homeless! HeLP provides a means for people anywhere, anytime to search for a missing pet. Shelter found listings, public found listings, adoptable, deceased, and sightings are all available in one location. This means even when the shelter is closed for the weekend or a holiday, a pet can get back home before the shelter reopens. No double entry needed. The purpose of HeLP is not to replace your current systems, but to connect to them automatically. For smaller shelters with no system it means they can now have technology they could never afford. Fast and easy setup. In just a few minutes, your shelter can be set up to begin taking advantage of public lost/found listings which will reduce the number of reports you need to take over the phone. Automating your intakes can be done at a later date and will depend on your current system. Our software and services to your shelter and the public are always FREE. Our national map-based database eliminates county and municipal borders allowing the public, shelter staff, and volunteer lost and found groups to access one central location to view lost/found listings saving the public and shelter staff time. This increases the number of pets that will get home and also decreases the time they will be in your shelter, freeing up valuable kennel space and resources for other pets. Pet owners can provide additional private contact information available only to shelters and veterinary clinics. You can access this information as soon as your shelter joins using this link: www.HelpingLostPets.com/ORG . For pets that have invalid microchip information or no microchip, this allows your shelter to search for them in our system and connect with the owner. Add your shelter using this link: www.HelpingLostPets.com/ORG . We recommend having a common login account that all of your staff share, allowing any of your staff to access private contact information for pet owners. Have the public manage their lost/found listings. If your shelter is taking lost/found reports over the phone and filing them in a binder or updating your website with the listing, HeLP can eliminate this process, saving your shelter time and money. Have the public enter their own lost/found listings from home or at a computer that is set up in your shelter.. Most people have access to a computer or have a friend or family member or coworker who does. List found pets that come in to the shelter. This puts them in the same database that the public is searching for lost/found pets. HeLP can automate this process and is connected with several different shelter management systems. Set up a kiosk in your shelter for the public to list lost/found pets. This allows them to look for a lost or found pet while at the shelter, as well as the opportunity to list the pet immediately. Having a kiosk in your lobby will save your staff a considerable amount of time and money by allowing the public to enter and manage their own lost/found listings. Train staff and volunteers to use the system to match lost/found pets to increase the success of the HeLP program. Incorporate this training into your training manual for all new employees and volunteers. Have office staff refer people to our site when presented with a lost or found pet. Ask your local veterinary clinics to sign up and become part of the HeLP network. This allows shelters and veterinary clinics to share the same lost and found listings. Display lost/found listings on a bulletin board using our 4 to a page flyers for the public to view when they come in to the shelter. Equip animal control officers with printed flyers of lost pets in your area. You can even print them 4 to a sheet to save on printing costs. This gives officers a good clear photo of each pets lost in that area as well as the owner’s contact information. This can be used to get a pet home before the pet ever reaches the shelter. Using the HeLP app from any Android phone, animal control officers (or the public) can view our map of lost or found pets in the area. Additional tools can be added to your website at your request to display intakes that have been uploaded to the HeLP system. Watch this video and hear what one shelter director in Walton County, Georgia has to say about using helpinglostpets.com to manage his shelters lost and found listings.